Kadzik was in a unique position. He had his hand in the investigation in his role at the Department of Justice and another hand in his role as that Department's Chief liason with Congress. He is a good enough lawyer to know that he just completely compromised both his own Department's Investigation, and Congress's investigation by telling the Campaign Chair of that investigation's subject when questions would be coming and from whom. Kadzik's longstanding connections to the Clinton's inner circle in general and former White House Chief of Staff in particular were the driving force behind his career and that of his son PJ. Kadzik's wife Amy Weiss worked under Podesta in the Clinton White House as Deputy Press Secretary and they attend regular dinner parties with John and Mary Podesta and John's lobbyist brother Tony and his wife. Tony brought a special bottle of wine worthy of email announcement prior to their October 23rd 2015 get together. Because of the closeness of his parents to the Podestas, PJ Kadzik reached out to John Podesta for a job on the Clinton Campaign, which would build on his previous work at his mother's media consulting firm and his internship at a Lobbying firm run by the third Podesta on K Street, Heather Podesta. Bonding themselves to the Podesta clan was a well informed set of career moves by the Kadziks both elder and younger. 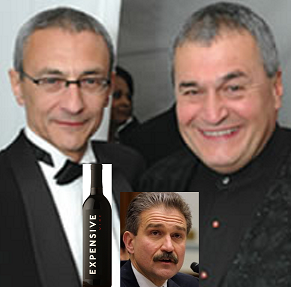 In addition to John Podesta being the most inner of all the inner circle for both Clintons, and both his brother and daughter having their own K Street Lobbying firms, there are less well known but still well placed Podestas. Gabe Podesta is a key prosecutor for the Air Force JAG office. Mae Podesta worked at the Clinton foundation in their health care initiative. Mary Podesta is a lawyer formerly with the SEC. Meanwhile her brother in law lobbies for her to remain asleep at her desk. The closeness of the Kadzik and Podesta clans was not just a revolving door between firms. As a private practice attorney the elder Kadzik got his foot in the door defending John Podesta during Ken Starr's 1998 investigation into his role in the Lewinsky affair. Podesta allegedly helped get Lewinsky a job at the UN where PJ Kadzik also briefly worked. The elder Kadzik's role was pivotal. According to Podesta "[He] kept me out of jail." Podesta is not the only one involved in the Clinton email scandal who owes Kadzik a deep debt of gratitude. Acccording to his own bio on the DOJ website Kadzik "led the successful effort to confirm Attorney General Loretta E. Lynch and Deputy Attorney General Sally Q. Yates." Thus as the key link between the Obama Administration’s law enforcement arm and Congress, he managed to influence the latter to hire his boss at the former. Thus while he was an insider to an investigation into the Hillary Clinton his boss who had the last word on the same investigation while owing him. Was this single email the only time he leaked information to Clinton's inner circle? Was Bill Clinton remarkably well prepared for his secret meeting with Loretta Lynch in June of 2016 when the investigation died on the Tarmac? The world may never know. Some basic issues get email alerts. Long term friendships are nurtured over bottles of wine you get from a guy named Tony. Government corruption is a Podesta family value and the Kadzik family seems to have hitched itself firmly to this new, although quiet, American dynasty of politics and corruption.